The critically acclaimed Seattle Pro Musica are celebrating nearly four decades of excellence this year in the choral arts and asked me to update the portrait I made of them a few years ago. The last time, we assembled in a park on the shores of Lake Washington that was not far from a church they were going to be performing in. This year I photographed them outside the doors of the Saint James Cathedral prior to another performance they were about to have there. Named “among America’s very best choirs” by American Record Guide, Seattle Pro Musica embarks on its 38th season in 2010-2011 with a trio of magical performances. I was asked to make a large group portrait of the entire cast including munchkins and backstage workers for the Salmon Bay Elementary School production of “The Wizard of Oz”. Immediately after the last performance on Saturday, I set up my lights and watched the play. It was really great. They had already performed it 3 previous times and were really into it. After the last bow was taken I sprang into action and with the help and patience of all involved, we made the above photograph. I would like to thank everyone for their cooperation and special thanks to Glyde King the producer, director and 7th grade teacher who made this such a wonderful production for all. Panoramic Photography by Seattle photographer Daniel Sheehan who creates portraits for publications and a Seattle Wedding Photographer with an artistic photojournalist style. 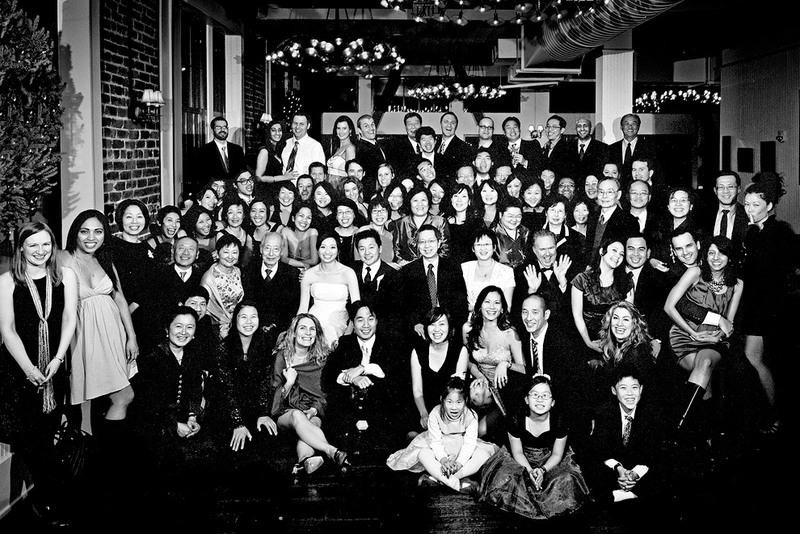 One of my favorite assignments is photographing large groups of people for corporate clients or wedding clients. Here is a recent wedding panorama taken at the wedding of Kerri Higgins and Graham Sheldon at McCurdy Park and the Museum of History and Industry, MOHAI on August 15th. Everyone in attendance lined up on the waterfront where the ceremony had just taken place for a large group portrait.The light was perfect and the setting was fantastic with Lake Washington and the Montlake cut in the background. Phil Kelly has been working on a new CD project,out at Bear Creek Studio in Woodinville recently, his first big band jazz album under his own name, “Convergence Zone” which is scheduled for fall release on Origin Records. I got to make a panoramic photo of the whole band on a break out behind the studio. Phil is seated at right. In addition to more than 40 years as a composer / arranger for film, TV, and other media applications, Phil Kelly has written for bands like Bill Watrous’ NY Wildlife Refuge, the Old Tonight show band , Doc Severinsen, Si Zentner, as well as functioning as arranger/ conductor / drummer for vocalists Buddy Greco, Julius LaRosa, Frank D’Rone, Sylvia Syms, John Gary, Jenny Smith, and Al ‘TNT’ Braggs among others.. Early on in his career, he also logged several years as a jazz drummer with artists such as Terry Gibbs ,Red Garland, and Denny Zeitlin as well as years of work as a studio and recording drummer. In addition to his film and TV writing, He has written music for over 500 national commercials , ESPN, ABC Sports , NFL Films, and industrial films and shows for Cadillac, Chevrolet, Volkswagen, American Airlines and Zales Jewelers. I had the pleasure to be called in to Salmon Bay Elementary School in Ballard again this year to make a panorama group portrait of the cast of their annual Shakespeare play. Last year was my first such assignment. It is was again a challenge of working with the kids and then such a pleasure when the prints were delivered. I donate one to the school and charge a nominal fee for the students to get a 12 x 36″ print. Delivered 35 prints today. Photograph by Seattle photographer Daniel Sheehan, a photojournalist specializing in photojournalism and portrait photography for publications and corporations and a Seattle wedding photographer with an unobtrusive, story-telling approach creating award winning Seattle wedding photography and wedding photojournalism ranked among the best Seattle wedding photographers by the WPJA. I photographed the Seattle Pro Musica Choir recently using the panoramic camera and finished processing the first picture from the shoot. We had a beautiful Seattle fall day on the shore of Lake Washington. Seattle photographer Daniel Sheehan, a photojournalist specializing in editorial photography and portrait photography for publications and corporations, and a Seattle wedding photographer with an unobtrusive, story-telling approach, creating award winning wedding photojournalism, is ranked one the best Seattle wedding photographers by the National Association of Wedding Photojournalists.